What is an Indoor Potty for Dogs? 1. How Do You Clean an Indoor Dog Potty? 2. 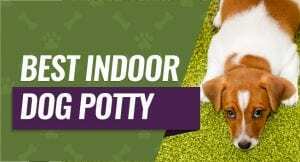 Where is the Best Place Indoors to Put an Indoor Dog Potty? 3. Will an Indoor Dog Potty Work for my large Breed Dog? 4. Will an Indoor Dog Potty Work for my Male Dog? What is the Best Indoor Dog Potty System? Ideally, you want your dog to be able to go potty outside all year round and in all kinds of weather conditions. 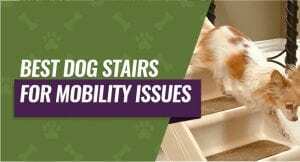 However, this may not be possible if you or your dog have health problems, you live in an apartment building or large city, or if your dog has an injury that makes them have bladder control issues. The best indoor dog potty can solve all of these problems in one go. However, there are dozens to choose from along with a lot of different criteria to consider, and this is where our guide and review roundup will help you make a good choice and point you in the right direction to start shopping. Traditionally, an indoor potty for your dog consisted of newspaper or pee pads strategically placed around your home. However, you can now buy both artificial and real grass indoor potties with trays that slide out to empty the waste or a dog litter box that acts just like a litter box for cats does. It can be easier to train your dog to go potty on the patch of grass because it mimics their natural environment. You may want to try out a few different types of dog potties before you find the one that works the best for your dog. As we briefly mentioned above, indoor dog potties fall into five categories, and it may take some experimentation to find the one that your dog is willing to use. A pee pad is the more traditional potty for your dog along with newspaper that has been used for years to give your dog a designated area to go to the bathroom indoors. You can get pee pads that are slightly scented and designed to draw your dog to them when they have to go to the bathroom. Pee pads usually have a soft cloth with slight padding on the top layer with an absorbent layer on the bottom that stops the pee from leaking through on the floor. They're disposable, and you simply pick them up, throw them away, and replace them when your dog goes to the bathroom. These work really well when used with a portable dog fence to help keep puppies in one area. A popular type of dog potties come with a removable tray along the bottom, and the top is designed to look and feel like artificial grass. This can entice your dog to go to the bathroom indoors if they have issues doing so. Artificial grass is designed to be used over and over again, and you can clean it with a quick spray with a hose or in the bathtub. You do want to clean both the grass and the turf out each day to ensure that it stays clean and that it doesn't smell. A slightly more expensive dog potty for indoor use is made with real grass that has an established root system to help absorb the odors that come when your dog goes to the bathroom. You can set up delivery options, so all you have to do is toss the old potty and recycle it with a new one. Companies grow this grass and ship it to your home, and it is real grass so your dog shouldn't have any problem standing on it or using it to go to the bathroom. So there is no cleanup, no smell, and it's easy to replace. If your dog likes to go to the bathroom in the sand, a litter box is a viable option for an indoor potty that you can try with your dog. You can buy dog litter boxes in several sizes, styles, and colors, but they are generally better for smaller dog breeds. The litter absorbs your dog's pee, and this can help to contain any odors that might appear if you don't clean it every day. Additionally, the litter pan has walls that hold your dog's waste, and they're easy to clean and maintain. The grate-style dog potty is a low pan that has a detachable grate that fits over the pan. Your dog steps on the grate, goes to the bathroom, and the waste slips through the grate and into the pan. You simply detach the grate, dump out the waste, and rinse both parts of the potty to clean it. You can use it over and over again, and it's usually made out of a rigid plastic that won't bend or flex when your dog steps on it, so it's stable enough for them to stand on. Housetraining Trouble: Some dogs are very stubborn when it comes to housetraining them. An indoor potty can help to give your dog a place to go to the potty to avoid accidents and setbacks in the house. Bladder Control Issues: Maybe your dog has bladder control issues that makes it difficult for them to know when they have to go to the bathroom, and it's too late when they realize it. An indoor potty can give them a closer place to go when the urge strikes. Limited Yard Access: Do you live in an apartment or in a busy city that has limited yard access? If you do, one of these indoor potties can give your dog a place to go to the bathroom so you won't have to worry about finding a spot for them to go outside. Owner Limitations or Sickness: Perhaps the dog's parents have a physical disability that prevents them from going outside when their dogs have to go out. If you get sick and can't get the energy to go out, this gives your dog a place to go. Getting your dog to actually use the indoor potty can be a trial and error process as well. However, there are some useful tips that can help you train your dog to use the indoor potty. If your dog is young, start training them to use the indoor potty very early on so they get used to it straight away. However, you can also introduce it to your older dog or a dog that you brought into your home from a shelter. Dogs have a bathroom routine that is unique to each dog. Find out when your dog likes to go to the bathroom including before or after meals, in the evening hours, or in the morning hours so you can start getting a routine in place that matches your dog's patterns. You might get frustrated when you're trying to teach your dog to use their new indoor potty. However, you want to use praise an positive reinforcement to encourage your dog to use their indoor potty. How you clean your indoor dog potty depends largely on which type of potty you have because some are more complex than others. If you have an indoor grass-style potty, start by removing any feces or feces products you see and dispose of them. Next, take the grass or tray out and get rid of any urine that may be in the bottom of the tray. You can simply dump it into your toilet and flush it down to get rid of it before you get some warm and soapy water and wash the base down and grass down. If you have a tray with a pee pad, remove the wet pads and dispose of them before washing the tray with mild soap and water. You can then wipe the base dry and replace the pads, or wipe the base dry and replace the artificial turf. You should plan on emptying your doggy potty at least once a day or once every other day. You want to take it apart and do a thorough clean at least once a week or more to prevent it from smelling or getting saturated. 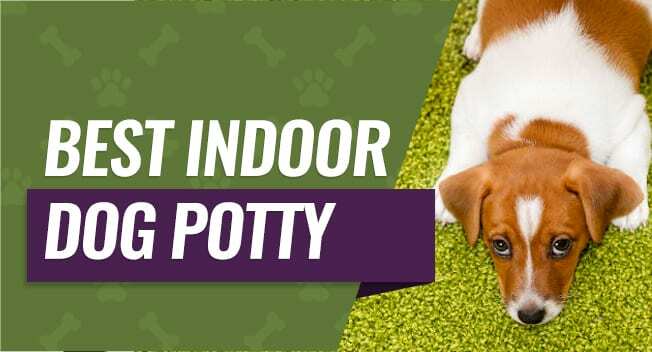 Ideally, you should place your indoor dog potty away from high traffic areas in your home because you don't want your family or guests looking at it as they pass by. Maybe you have a spare room or a laundry room that you can keep the door open and allow your dog to come and go as they need to do their business. You should really think about this placement because you don't want to move the potty around much and risk confusing your dog when they try and find it. Your dog should feel safe and secure wherever you decide to put your indoor dog potty, and a small room that is slightly out of the way is a great idea. The short answer is yes, an indoor dog potty will work for a larger breed dog as long as you buy a slightly larger indoor potty to accommodate their larger size. Your dog should have more than enough room to move around and feel comfortable when they need to use the indoor potty. Indoor dog potties generally come in small, medium, and large sizes. Since you have a larger dog, you want to get an indoor potty that is at least two feet wide by three or four feet long because this will give your dog more than enough room to move around and adjust themselves. You can train male dogs to use an indoor potty, but you have to keep in mind that they will start lifting their leg to relieve themselves as they get older. This means that you have to think about your indoor potty placement, and you may also have to get a slightly more elaborate one to avoid splashing urine where you don't want it. You should consider putting your dog's indoor potty in a corner because this can help to narrow down any possible splash area. Additionally, you can buy special siding that goes over your walls and over the surrounding floor to protect it from accidents. You should plan for at least 10 inches of splash guard around your dog's potty and up the wall. This indoor potty comes with real grass that is grown hydroponically, and the real grass acts as a natural attractant for your dog. It's also very eco-friendly, and you can simply dispose of the pad after a few weeks and get a new piece of grass. This grass has slightly raised sides to help keep your dog's waste products on the grass and off of your flooring. You can use this potty indoors or outside on a balcony or patio without an issue, and it acts as a natural deodorizer. Pet parents who bought this indoor potty liked the fact that you get real grass shipped to your door and that it works as a natural deodorizer to help cover up the smell of your dog's waste. They didn't like that it is more expensive to order or that the box you put the grass in is made out of cardboard. These pee pads are designed to lay flat on your floor, and they're made with a reusable fabric that is easy to clean and maintain. It retains and absorbs any dog waste, and it also contains odor-blocking technology. This pad has four durable an waterproof layers that lay on top of a waterproof backing so your dog's waste will stay on the pad. You can rinse them off with your hose and toss them in the washing machine to clean them as well as the dryer to finish the cleaning process. Pet parents who purchased these pee pads liked that it was made with four durable layers and it had a waterproof backing to protect their flooring. They didn't like that these pee pads tended to fray around the edges after a few washes, and they don't withstand digging very well. This indoor potty is made with artificial turf as the top layer, and it has two additional absorbent layers including a removable pan on the bottom that makes cleanup easy. It also comes in two different sizes so small and larger breed dogs can use it without a problem. The mat has antimicrobial and odor absorbing properties that make this mat a more clean and hygienic option for pet parents to have around if they have kids. The plastic insert locks securely in place, and you simply have to slide it out, dispose of the waste, and rinse it off with warm and soapy water. Pet parents liked that this indoor potty comes with three layers that have antimicrobial and odor-absorbing properties, so it's healthier to have around your home. They didn't like that it can be difficult to unlock the tray when they had to clean it. This indoor potty comes with a rigid grate that sits directly above a shallow tray so the urine runs through the grate and away from your dog when they use it. You can leave the tray empty or you an add newspaper, a pee pad, or a reusable pad for the urine to soak into. The grate also keeps your puppy away from the pads underneath it so they last longer and you can save money with them. It's very easy to clean and maintain, and you can rinse it off and wash it with warm and soapy water to clean it. Pet parents liked that the grate technology funneled the urine away from their dog's paws, so they didn't track it all over the house. They didn't like that it had a very lightweight design that could shift and move around the floor. This litter tray comes in five different sizes and nine different color options so you can easily customize it to suit your dog's size and needs. It features low walls and a wider opening so that your dog can get in and out of the litter box easily. You do have to purchase litter separately for this pan, but it comes with an instruction manual with training tips so you can teach your dog to use the litter box quickly. The walls are tall enough to contain your dog's waste products, and the litter works to control any odors. Pet parents who bought this litter box liked that it had lower walls and a wider opening that their dogs could easily maneuver around in and that the litter works to control odors. They didn't like that the litter box doesn't come with litter and that they had to buy it separately. Our top pick for the best indoor potty for your dog is the Fresh Patch Disposable Dog Potty with REAL Grass. The natural grass will work as a natural attractant for your dog, and it also works to absorb odors into the root system and eliminate them when your dog goes to the bathroom. Additionally, you can also set up an automatic order system that allows you to simply throw the used grass away and replace it with a new piece of grass. Finally, it also works for both indoor and outside use, and it's a comfortable and familiar option for your dog to stand on and use.